Uglyworld #253 - Thank You Santa, originally uploaded by www.bazpics.com. 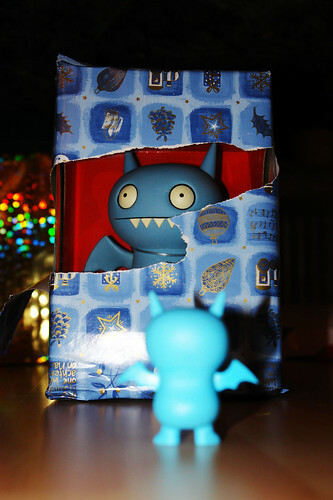 Ice-Bat was very hard to keep under control ever since I showed him the present Santa had left for him earlier today, we even considered sedating him for a few hours so that we could get some peace and quiet, but thankfully he lowered his blood pressure all by himself by the time dinner was served. After dinner we sorted out all the presents under the tree and made Ice-Bat wait until everything else was opened (he complained at first, but once we explained that it meant everyone would be watching him open his he was really excited again). Finally when all the other presents had been opened it came the turn of Ice-Bat to open his present from Santa, we told him to be gentle as it could be something fragile inside, so he flew up and then using the tip of his wing cut through the paper to reveal the contents of the present. "A big brother, all for me, Santa is the coolest person alive, after my new big brother of course! ", screamed Ice-Bat at the top of his lungs. It would appear Father Christmas is 100% alive and kicking after all - cheers Santa!